Spring is near! And with Spring comes cleaning. Getting rid of the old and making way for the new. Fresh Wave odor removing gel and odor removing spray can help with getting your home into shape. 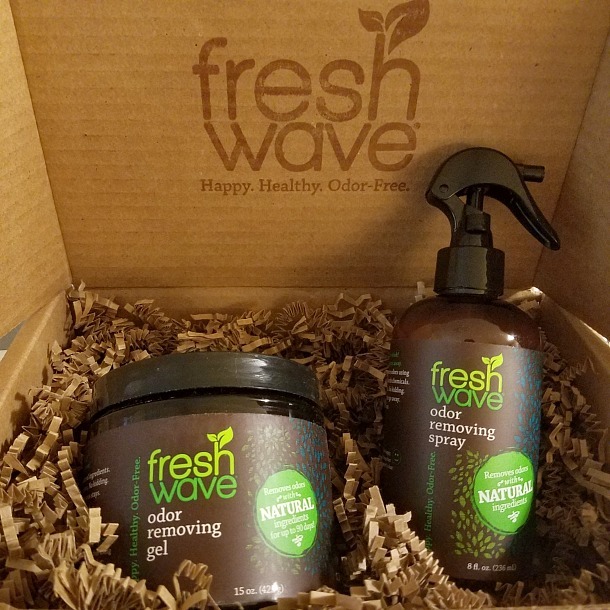 We love the Fresh Wave products for our home. Natural ingredients that are safe around the children. Fresh Wave odor removing gel can be placed near the toilet in the bathroom or buy a garbage can. It really does work. The Fresh Wave spray is great to use through out the home or even in the car. Fresh Wave is safe, natural, and it works. Where else can you use it? Spray that diaper pail. Leave the odor removing gel near a cat litter box. There are so many possible uses. Give Fresh Wave to any college student. We all know that college dorm rooms need to be cleaned too. Fresh Wave Prize Pack giveaway for you to win. You have the chance to win a Spring Cleaning Prize Pack that includes the odor removing gel and the spray. I wonder how this would work with my shoes. I would love to try the odor removing gel. And I love how it's all natural. I love finding natural cleaners! Almost every cleaner gives me headaches, so I'm always looking for something better! I would love to spring clean with Fresh Wave. I hope to win. I am so excited to try this product. We could use some natural odor removing spray at our household! Im going to be starting my spring cleaning and would love to use Fresh Wave. Thanks for a chance. I would love to use The Odor Removing Spray! I would use the spray on the trash can, in the bathroom and in the car. I would love to try the Odor Removing Spray, I love things that are all natural. I would use these products near the cat litter box area, thanks! I'd love a chance to try this. I would like to try this out near the litter box. Products with natural ingredients are essential, and it'd be awesome if this worked well to absorb odors like baking soda, only better! Winning this would be a great help as I transition my household to all natural products. THank you! I love Fresh Wave products-thanks so much! I am in desperate need of trying these out due to 2 cats and 2 adults with full-time jobs that sometimes forget to take the trash out, scoop the litter box, etc!! For my teenagers room ! Please! I love all of the new products that have gone natural. So many ways to clean without using chemicals! Spring is just around the corner, time for spring cleaning! I have an 18 year old young man. He still has the funky smell going on. I am willing to try anything! I would like to try odor removing gel for my pet's odors around my home. I would love to try this in my living room. It's where the dog spends most of her day. Nothing like trying a decent product for spring cleaning motivation! Natural is the way to go whether cleaning, cooking, taking meds. I would love to see how these cleaning products work. These cleaning products would be a nice addition to our household. I would love to try these products you reviewed and the laundry booster as well. We used the gel by our daughter's diaper pail and it worked great on weel old cloth dipes! I love fresh wave, it is awesome! It eliminates bad smells so well. I would recommend it to everyone!! I love natural cleaning products. I would love to try these products out. Now this is something I could really use.. This would be so perfect for Spring cleaning which I am now starting.